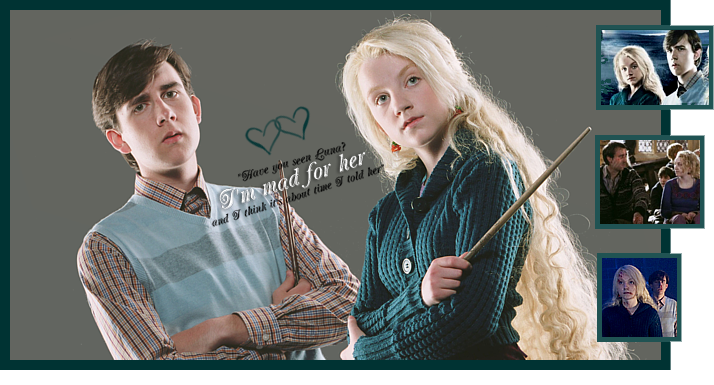 Welcome to "Mad For Her," the TFL-listed fanlisting for the relationship of Neville Longbottom and Luna Lovegood from the Harry Potter series. Use the navigation above to view the different sections of the site, and if you're a fan of Neville and Luna's relationship, please join! We have a new member! Welcome to Anne-Sophie! Neville Longbottom, Luna Lovegood and all other characters and situations related to Harry Potter are property of J.K. Rowling, Warners Bros. and etc. No copyright infringement is intended. This is a non-profit website. The layout was made in Photoshop Elements 5.0 with brushes from Brusheezy, and it was coded in Notepad.